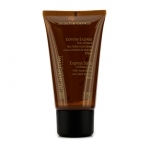 lynda muller : Academie Express Scrub. This is a nice exfoiliator for people that do not want harsh granules. It has a menthol or cooling feeling on the skin and is very gentle. I am prone to Rosecea and so I need something fairly gentle and this makes my skin feel very nice after I have used it.